(If you’d like to see other questions (and answers) <— just follow this link. I am wondering how you began this line of work? How long did it take to take off/spread the word? Since my son had been born I’d harboured a dream of having my own business, but found it difficult to see how I could explore this when I had a (very good) salaried position to go back to. I was really inspired by my sister, who lives in America, and her cake business. I wanted to use the skills I’d developed in business and management, but do something more crafty and creative. In 2011, another restructure was on the cards which included reducing staff numbers. 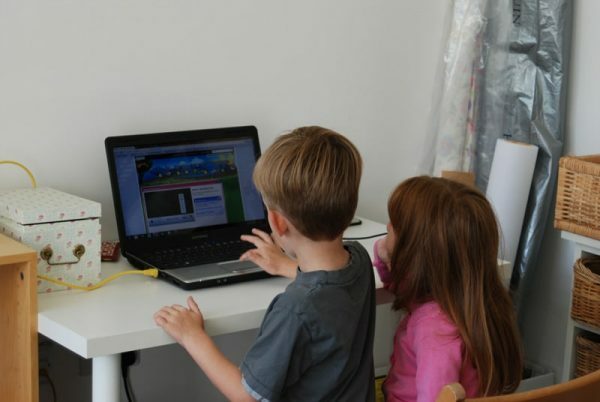 My youngest child was starting school that Autumn, and a redundancy package was on offer which gave me a chance to get something set up with a financial cushion – I grabbed the chance! Patchwork and quilting were my favourite hobbies and I’d made quite a few quilts. I also really enjoy applique. As I started to explore what my little business might look like I looked at a range of things including creating personalised or bespoke cushions with applique and embroidery, personalised/appliqued patchwork quilts and also applique pictures (new baby birth samplers, nursery pictures, wedding keepsakes – that kind of thing). I’d heard about memory quilting, although at the time it was pretty unusual in the UK. I had bags of clothes from both my children that I didn’t want to give away as they held so many memories, cute motifs and lovely fabrics. My sister and I have always joked about the huge amounts of fabrics my mum has in her loft and cupboards, that more often that not didn’t make it into a finished article. I’d always said that when the day comes that we have to clear all that out (hopefully a long way off!) I’d make a couple of quilts using a sample from every piece. Quilting using clothing seemed like a really great idea. Making patchwork quilts from new fabrics is really fun, but it’s extremely difficult to do it commercially. The cost of good quality fabric and other materials needed to make a quilt already makes it prohibitively expensive for most people, and that’s before you add on labour, expertise and any element of profit. Set that against the availability of mass produced patchwork quilts, where you can pick up a king size quilt for under £100… well I couldn’t see how I could make that work. It seemed to me that memory quilting would potentially make a really great business. Memory quilts are by their very nature bespoke, one off items. The skills and experience needed to make them well are quite different from mainstream patchwork and quilting, and pretty rare. The greatest difference however, is that we’re really in the keepsake market, rather that the quilting market, where people are after much more than ‘just’ a patchwork quilt or cushion. The first thing I did was practice practice practice! I absolutely set out with the aim of being the very best keepsake quilting provider in the UK. I made some memory quilts and cushions using my children’s clothes to refine my techniques, and then asked a friend if I could make a quilt from her daughter’s clothes, for free, but treating her as a customer, and using the approach I planned for paying customers, just to check it would work! I signed up for a studio space at Woodend Creative Workspace in Scarborough. It’s a really beautiful location to work from, and I felt awfully professional when I got the key! An official name plate! We were good to go! 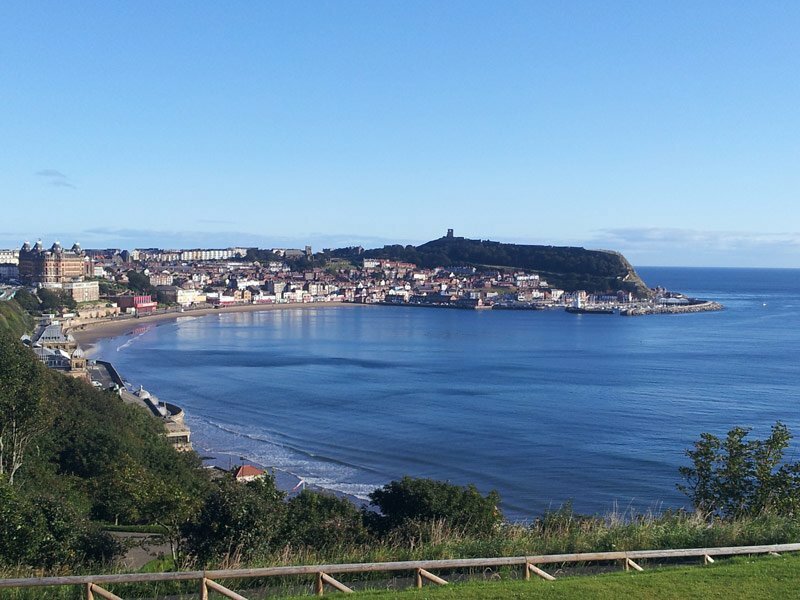 My commute to work – not so shabby! I bought a fancy pants new sewing machine that would handle the amount and size of quilts I hoped I’d be working on, upgraded quite a few other bits of equipment, begged and borrowed furniture to kit out the studio, and stocked up on supplies so I was good to go. I worked with my lovely and very talented friend, Amy Kendall, to put together a logo and colour scheme. My husband helped me set up a basic website and we were off! 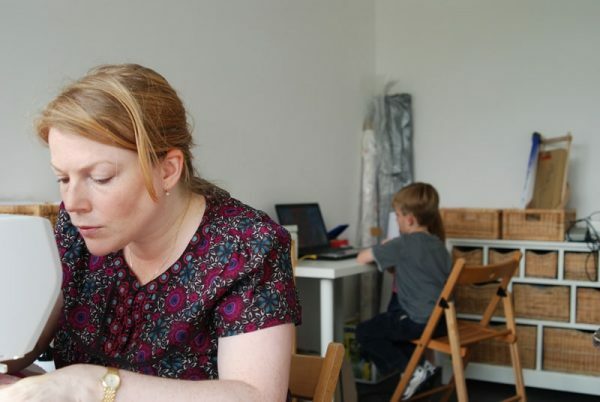 Hard at work in the new studio – looking very serious! 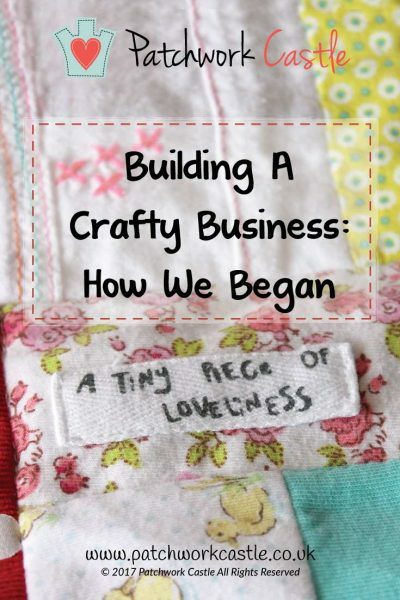 In the late summer of 2011, I started blogging about the process of creating my friend’s quilt, and that immediately brought in external customers. The vast majority of our early customers found us through Google search. I’d expected the focus to be on baby clothes quilts, but within a couple of months I had commissions for memorial quilts using adult clothing. Demand picked up very quickly from there. It was such an honour to be trusted with all those special memories, and the feedback from customers often brought me to tears (still does if I’m honest!). It’s fair to say that things took off much quicker than I expected and all the other ideas I’d toyed with were parked as I was so busy! The very first commission – playing around with ideas. Within 12 months the business was covering all its costs, and I was able to pay myself a basic salary. 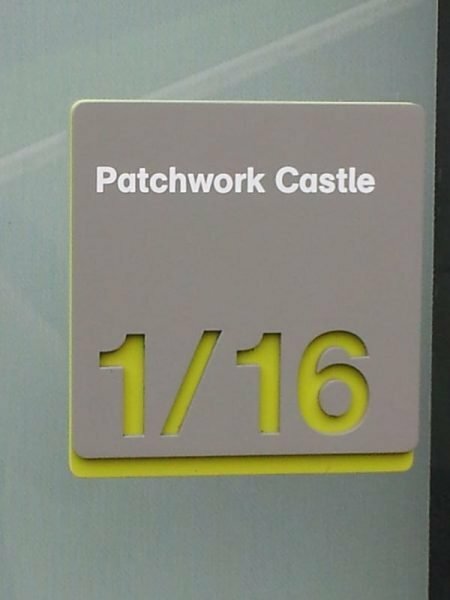 Since then we’ve grown to our current position with 4 people sewing for Patchwork Castle, and I still do plenty of sewing from my now home based studio. 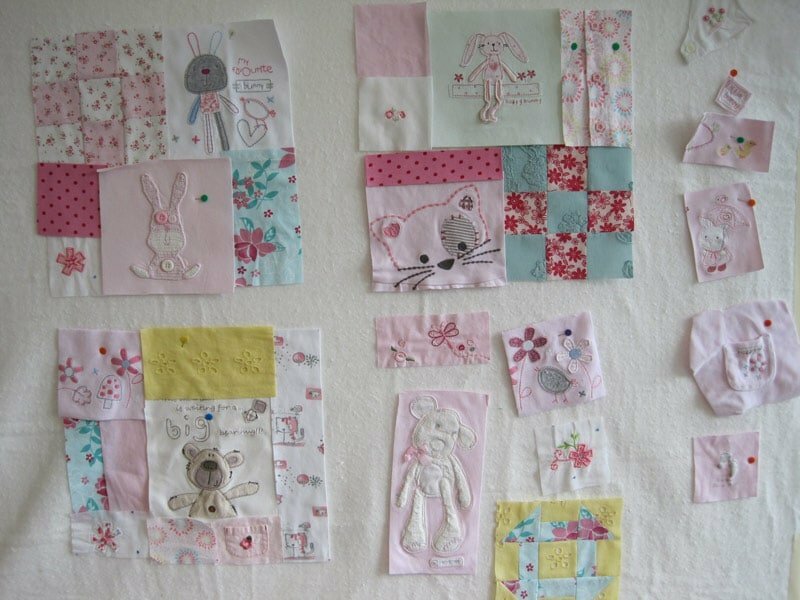 Our work is split fairly evenly between adult and children’s clothes keepsakes, with a few bespoke patchwork quilts thrown in there for good measure. We introduced the Baby Clothes Quilt Tutorial back at the start of 2015. ‘Make your own’ is an area I’m really keen to grow further, and support the many people who end up here on our website looking for inspiration and support to create their own memory quilts or other clothing keepsakes. It sometimes feels almost accidental that we’ve ended up where we have, but I’m so grateful that I found this sweet spot where we can create beautiful keepsakes for our customers, and make such a difference to their situation, whether that’s dealing with the loss of someone close to them, the sweet nostalgia of their growing children or being able to enjoy the memories of their own life experiences. Thanks for your question, Marina! I haven’t reflected back on those early days for some time and it’s given me a lovely fuzzy feeling. If you’re thinking of starting your own crafty business that’s brilliant. There’s a whole world out there of designer makers in all different fields, and loads of great support available too. I’m really happy to answer any questions you might have about my experiences over the last six years so please do comment below or email me if you’d like. That’s all for now. I’m going to come back and read this post whenever I’m feeling pulled down by the day to day and remember why I started it all! Another great blog post Chris. 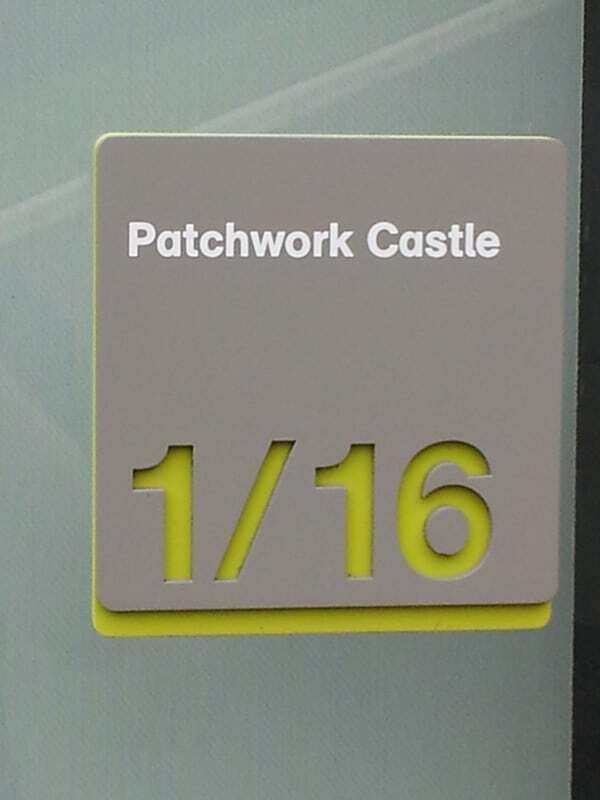 It’s lovely to hear how Patchwork Castle began and developed into the successful business that it is today. Would love to know if you need anymore staff. I have been sewing for 4yrs and have thought about setting up myself. Have done a business course.